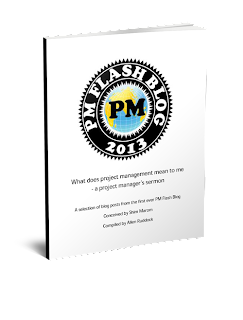 Musings on project management: All all PMs capitalists? Capitalism is not as popular as it once was. Nonetheless, it's still relevant. But, do we have a conscience? Do we care what we are working on? If we were asked to build the first "bomb" would we do it for the science and engineering, and leave the policy and philosophy to others? I've certainly had friends who've "opted out" of some programs. When I worked in the US DoD as a program manager, there things that gave me pause. Likely, most of us have paused at the juncture of capitalism and society at large. Human creativity develops a variety of ways to solve ... problems, but some inevitably work better than others, and we need a process for sorting the wheat from the chaff. We also need a process for making good solutions widely available. Capitalism is the mechanism by which these processes occur. It provides incentives for millions of problem-solving experiments to occur every day, provides competition to select the best solutions, and provides incentives and mechanisms for scaling up and making the best solutions available. The orthodox economic view holds that capitalism works because it is efficient. But in reality, capitalism’s great strength is its problem-solving creativity and effectiveness. [emphasis added] It is this creative effectiveness that by necessity makes it hugely inefficient and, like all evolutionary processes, inherently wasteful. Capitalism inevitably leads to the dichotomy of "win-win" or "win-lose": Solve everyone's problems, but each less optimally; or solve one problem optimally and let the others suffer. Classic game theory! (See Chapter 12 of my latest book on Maximizing Project Value"). Clearly, as PMs we don't relish "pulling our punch" and serving up the less optimum knowingly. .... the solutions capitalism produces are what creates real prosperity in people’s lives, and that the rate at which we create solutions is true economic growth, .... entrepreneurs and business leaders bear a major part of both the credit and the responsibility for creating societal prosperity. Here's another way to frame this that is familiar to PMs who read this blog: the focus of projects should be on outcomes first, inputs (like cost, schedule, specifications, shareholder value etc) second. As "outcomists" we can be cognizant of the larger landscape. As "inputists" we can be responsible for being good stewards of resources. But, outcome dominates input... in my opinion.